Noticeable short-term (last 3 years) population increases include Ring-necked Duck (29 to 82 birds), Northern Flicker (35 to 86), and American Robin having a big year (16 to 188). Conversely, European Starling has dropped (483 down to 238), the year-round resident Black-throated Sparrow alarmingly down (295 to 35), and Western Meadowlark becoming scarce (88 to 9). Our House Finch population experienced somewhat of a collapse in 2014, and though holding steady, this bird has not yet rebounded to its former numbers. Our total of 122 species is about average, and as usual, this number could be adjusted a little depending on acceptance of our rare bird reports by the CBC Regional Editor. The total number of birds (8,872) represents only a slight drop from last year’s total. CBC rules allow generic or species forms not otherwise included in the tally to be counted in the overall species list, thus I have added Teal sp., Selasphorus sp. and Lazuli/Indigo Bunting to our grand total. 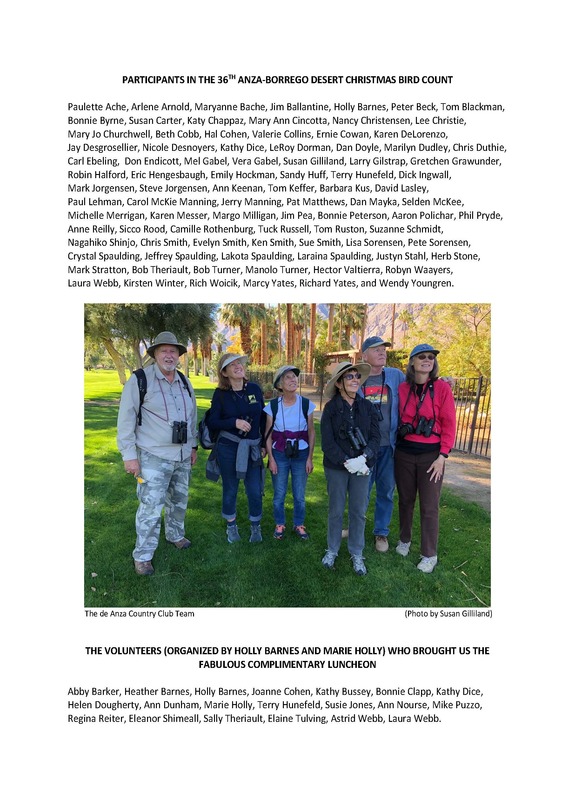 All volunteers are greatly appreciated for adding another data set to the Anza-Borrego Desert Christmas Bird Count!